Last night in Brighton I went to see the first showing of the Clean Bin Project documentary film on it’s UK tour! Pictured above are Grant and Jen, the stars of the film, who spent a year buying nothing new and competing with each other to see who could throw the least away throughout the year. If you haven’t seen the film I highly recommend going to see one of the free screenings listed on their website if you are in any of the areas they are coming to. 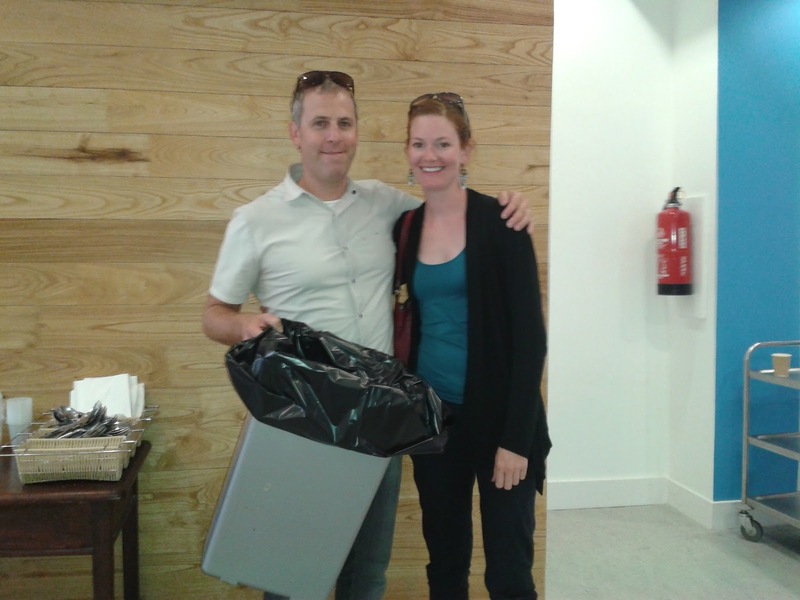 I found it so inspiring to see the tiny amount of rubbish generated by this couple over the course of the year and I gained a far better understanding of why it is incredibly important for all of us to generate as little waste as possible. I have done a lot of things to reduce my waste over the last two years, but I know that I could do much better. I need to do much better. We all need to do much better. In the UK, now is a great time to be thinking about reducing rubbish as from the 2nd to the 8th September 2013 is National Zero Waste Week. This year is all about food waste. I have signed up and have pledged to use up the things from the back of my cupboard, which have been lurking for too long! Go and sign up – you’ll save yourself a bit of money and will be doing your bit for the environment too. Once Zero Waste Week is over, I plan to sign up to the Rubbish Diet, which will further help me to slim my bin. Anyone up for joining me?? This entry was tagged eco, Frugal, Green, rubbish, thrifty, waste, zero waste. Bookmark the permalink. ← I really missed it!